I bought a Coke out of one of those machines, it malfunctioned like a Vegas slot machine and spit out a lot of quarters. Had the same experience many years ago at an early ATM machine! just kept dropping bottles out of the bottom slot.They just kept on comeing, bottle after bottle. Thanks for this post. I'm a foodie and for me, eating without a glass of my favorite ice-cold Coke is so incomplete. Coca-cola tastes even better through time. Always cold......heavy glass bottles. The machine would "release" 1 bottle after your put your coin in. My local grocery had one just like this. The drinks were 6 cents, and you HAD to put the penny in first!. And, these bottles had the location on them as well. Always fun to see where the bottle had originated. LeeFred, so you didn't end up in the electric chair within ten years? Some of the older generation in my family said that's what would happen to "those hoodlums" and me too if I don't stop hanging out with them. 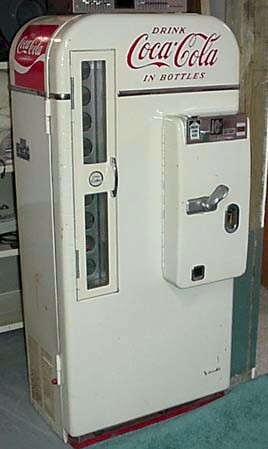 When I was a kid, we would sneak up to places that had these type of soda machines outside. We would have a bottle opener, a plastic or paper cup, and a couple of straws. We would open the little door, and use the bottle opener to open the bottle without paying for it. We would catch the soda with the paper cup, and then put the two straws together and drink the soda still in the bottle while it was in the machine. Free soda! I used to have a behemoth Coke machine that was wooden inside. I sold it. I also had one of the chest types where you slid your bottles out and pulled them up through a gate. Somebody stole it from my backyard! Coca-Cola bottles used to have the name of the original bottling plant on the bottom. The guys I worked with all checked the bottoms of the bottles to see if local bottles had made it home.